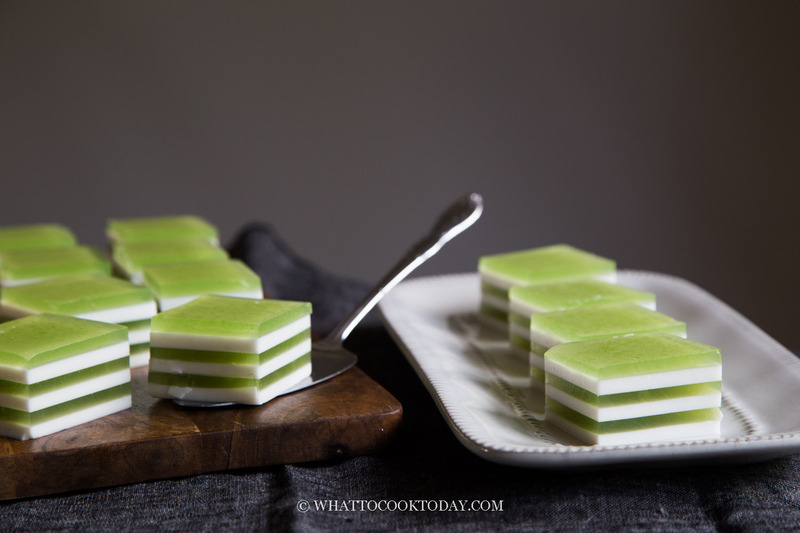 Coconut Pandan Agar Agar Layered Jelly Cake (Agar Agar Santan Lapis) – Layers of agar agar thickened coconut milk and pandan juice made this beautifully layered jelly cake. Super easy to make and light tasting. I grew up with mom’s agar agar jelly cake when I was a kid. My mom is totally not a baker, but making agar agar jelly cake was really her forte. She made agar agar jelly cakes with impressive designs like flowers and beautiful pastel layers for us as birthday cakes when we were kids. They were my absolute favorites. This agar agar santan lapis is a much more simplified version, in terms of design, compared to what my mom did, but this is still very tasty and light tasting. Super easy to put together too. Agar agar is made of algae that can jell liquid substance at room temperature. 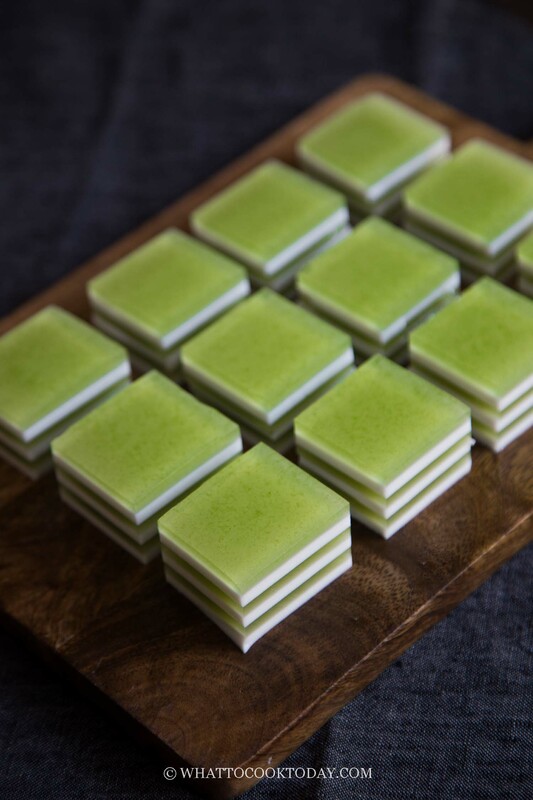 The word agar agar is of Malay origin but agar agar was first discovered in Japan and has been widely used in the culinary world and also in scientific experiments since then. Agar agar is high in fiber. 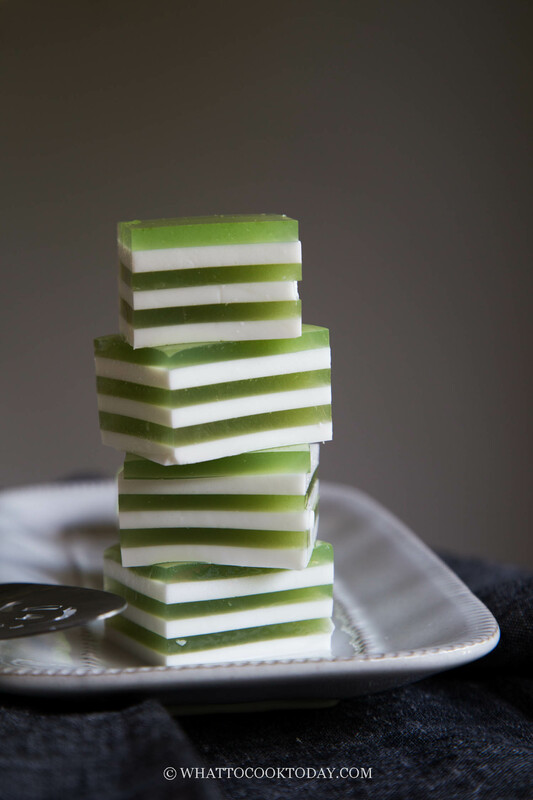 I remember mom used to make plain agar agar jelly cake (without sugar) to eat as a snack. It’s filling but it’s super low in calorie. It is also a perfect substitute for the animal-based gelatin in cooking. 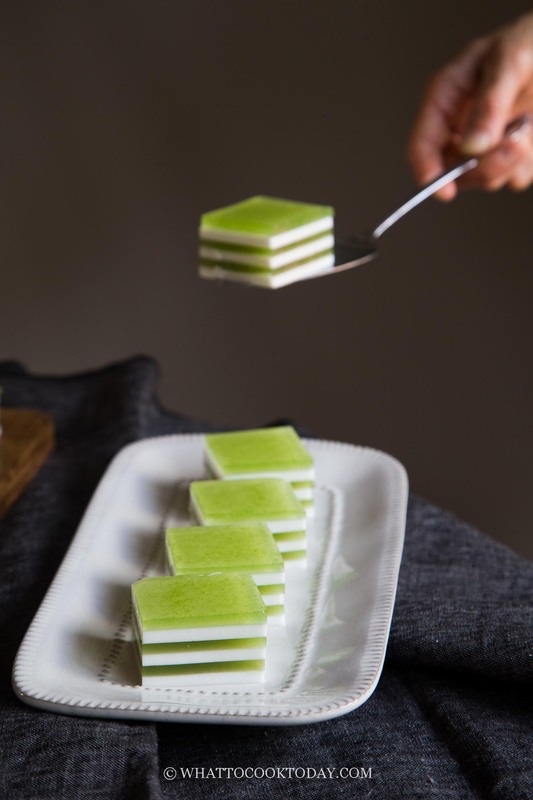 Agar agar santan lapis is one of the popular and easy layered jelly cakes in Indonesia. Santan = coconut milk and Lapis = layers. 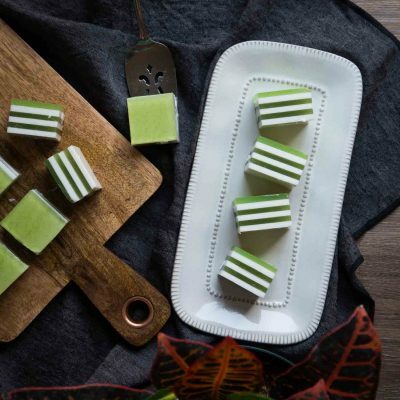 Coconut milk and pandan juice are cooked with agar agar powder and then pour into a mould and then chill layer by layer to form the beautiful green and white layers. This is much easier to make compared to this Lapis Legit or this Gao Teng Kue. 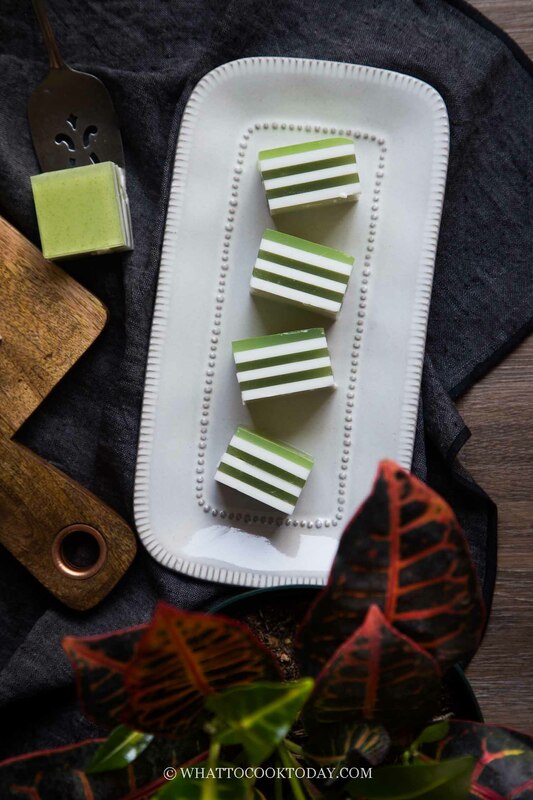 Layers of agar agar thickened coconut milk and pandan juice made this beautifully layered jelly cake. Super easy to make and light tasting. Agar agar santan lapis can be stored in the refrigerator, covered for 3-4 days. They do not freeze well. 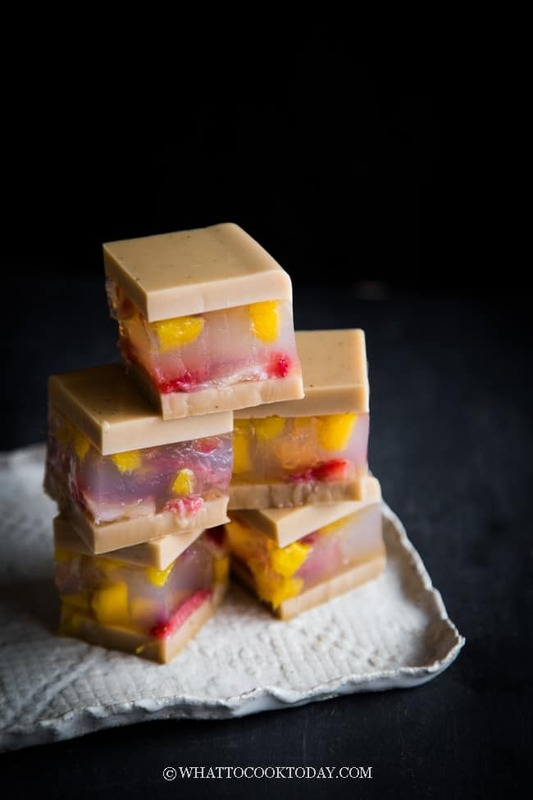 You might like this Coconut Agar Agar Fruit Jelly Cake too. These look so beautiful and elegant! 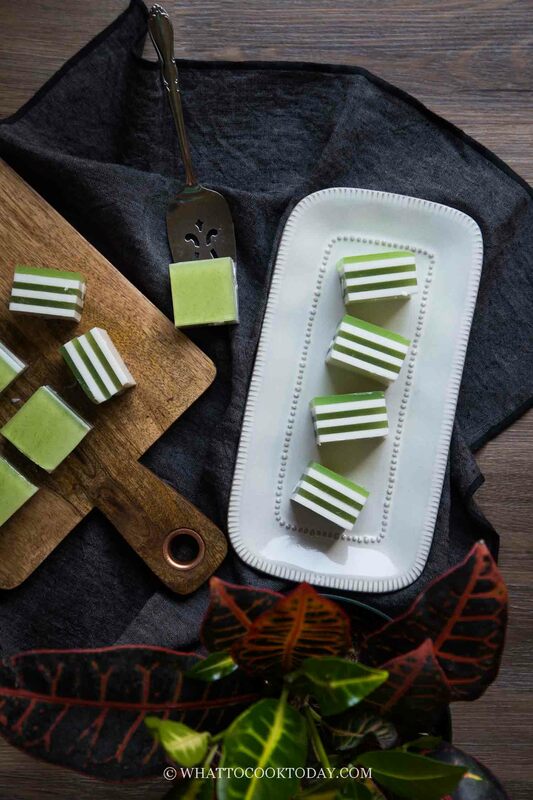 High-end dessert option by all means:) We recently made panna cotta with agar agar and I am dying to use it in a recipe again – will try yours! Hope I can find pandan leaves this week. Pinned! It should be 480 ml, not 240 ml. It’s a typo error. I’ve edited that. Glad you asked. I would have missed that error! I made this following the recipe, the agar agar turned out to be hard. What have I done wrong here? I used the trophy brand agar agar powder made IN Thailand. I use a measuring spoon for the agar agar powder. Sorry to hear that! Hmmm…I’m trying to figure out what might have gone wrong! I would imagine even though it’s a different brand of agar agar powder, it shouldn’t affect the result much. I will try to make this again and let you know what I find. I made this recipe again today and it turned out just fine. The texture is firm but still pleasant to eat, not jiggly wobbly like Jello if that’s what you are looking for? Maybe you can try half the amount of agar agar and see if you like the texture better. I tried making this recipe today but the first coconut layer just wouldn’t set. When you say to make sure the agar agar is dissolved. Means I stir in the agar agar powder in the coconut milk before I put it on the fire? Hi Michelle, yes stir the agar agar powder in the coconut milk and then when you heat it up on the stove (this part helps to activate the agar agar too), make sure you no longer see the agar agar or it won’t set when you chill it.